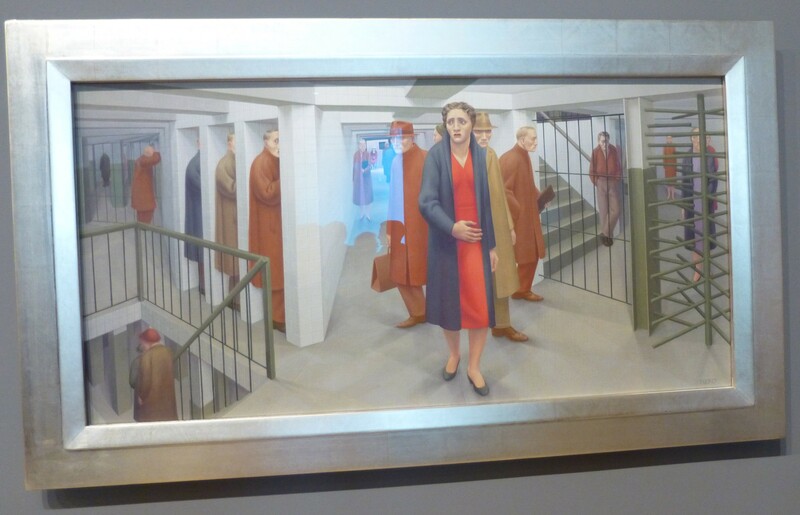 For The Subway (1950), George Tooker used a claustrophobic, labyrinthine subway station to portray the alienation and the isolation of contemporary urban life. These urban dwellers — all of whom seem to have the same face — seem frozen, trapped by the architecture of the subway station. Tooker rendered this distinctly modern subject in egg tempera, a medium associated almost exclusively with the Renaissance. The technique creates a smooth, matte surface and is ideal for making sharp, clear lines, which together lend the anxious scene an eerie placidity. The artist said that he attempted to paint reality in a way that would impress it “on the mind so hard that it returns as a dream.” I love this painting. Photographed in the Whitney Museum of American Art, now in its new home at 99 Gansevoort Street, New York, NY 10014, in the Meatpacking District, adjacent to the Highline.